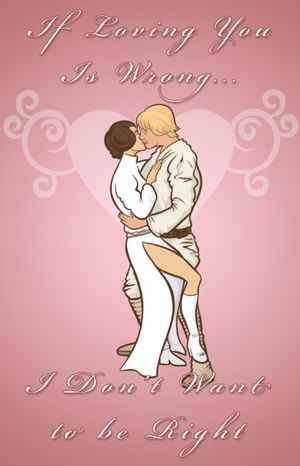 For thost of you participating in the St. Valentine’s Day Massacre, here’s a A Valentine’s card of the “If Loving You Is Wrong…” Star Wars Valentine’s comic that you print out for your significant sibling other. Posted in Comic Blog and tagged reader appreciation. Classic! Sent it to my S.W geek's wife for their V-Day! I love it, in the least wrong way possible. EDIT: Apparently, that link requires you to log in to the damn thing. Should be fixed now, if anyone cares. I love Luke and Leia. That card is great!! !